Your Pediatric Optometrist in Miami Specializes in Eye Exams for Kids! 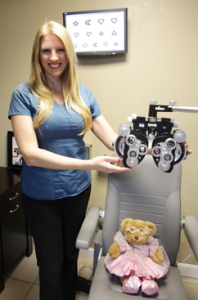 If You Need a Pediatric Optometrist in Miami, Look No Further! Many parents have questions or need a little educating on why being proactive with your child's eye health is so important. The following are answers to frequently asked questions and also some important "need to know" information. Infants should have their first complete eye exam at just 9 months of age. Then again at age 3 and age 5 and every year once they enter school. That may sound like it's too early, but eye exams are important because the eye develops much faster than the rest of the body. In fact, a child's eye is almost adult-sized by 3 years old! At birth, the eye is 18 mm and only grows 1.36 times to adult size, 24.5 mm, by age 7. Compare this to our body which grows 23 times from 8 lbs to the average 180 lbs. This shows how important the first years of life are to developing normal, healthy vision. Now we know that babies have big, beautiful eyes not just to look cute, but because their vision is developing very rapidly! 2) Why is it important to bring a child in from such a young age? 70% of what we learn is from our vision. Poor vision can cause delays in crawling, walking, developing speech, or social problems such as shyness or hyperactivity. For example, children with poor vision may not walk until later because they are afraid that they will bump into things. They may be very shy because they don't recognize people. Since they can't focus their vision well, they loss their attention easily and this can cause hyperactivity. Also importantly, if certain vision problems aren't corrected by age 6, permanent vision loss can occur. For example, Amblyopia (lazy eye) affects about 3 out of 100 children. Amblyopia is the leading cause of permanent vision loss in children and young to middle-aged adults. The most common treatment for amblyopia is simply glasses. When the amblyopia is diagnosed later or in only one eye, an eye patch or eye drop in the better eye may be prescribed to stimulate the vision in the lazy eye. 3) Are there any signs that parents should be looking out for that would point them to making an appointment with their optometrist? 4) What is the difference in terms of the examination process when you are checking the eyes of young children? 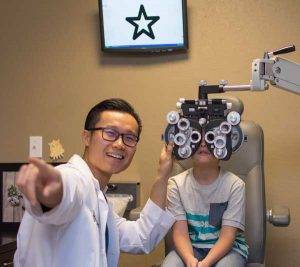 A pediatric optometrist or ophthalmologist has special training and equipment to tell if your child has any vision problems. For example, to check if a baby needs glasses, an eye doctor will hold lenses in front of their eyes and check if the light they shine into the child's eyes is in focus. This is done with an instrument called Retinoscope. Eye doctors in Miami often use many toys to get your child's attention. These techniques are very gentle and put children at ease. Instead of eye drops, I often use a gentle mist. We also do not use the air puff eye pressure test but a very gentle instrument for this measurement. Our office is decorated in fun themed rooms. Our waiting room is a jungle equipped with cartoons and many toys. Since many children are afraid of the dark, our dilation room is decorated like a planetarium. Planets and an orbiting space shuttle are hung from the ceiling and the room is lit by a moving constellation projected on the wall. Many of our little patients exclaim, "Wow, this is so cool!" 5) Do you find that some parents can express hesitancy in bringing in young children? What causes that hesitation? Unfortunately, many parents wait to get their children's eye checked because they are worried that their child will be scared. Although often children may be scared before the eye exam, they quickly start having a wonderful time. Most parents tell me how happy their children are to come for their yearly exams. One mother told me she had to reschedule the appointment for a week because her 5-year-old had a very bad flu. He asked every morning "Mommy, can I go to the eye doctor today?" Parents are also worried that their children are faking that they need glasses because their friend has glasses. There is no need to worry. A doctor that specializes in pediatrics has foolproof tests to know for sure if there is a vision problem. Believe it or not, children that are "faking it" is rare. Many children notice that they can not see things in school and their teacher says, "You can't see this? I think you need glasses." Then the children go home and tell their mother, "Mommy, I think I need glasses". Often the parents thought that there was nothing wrong. 6) Can you recall any particular story of a child that came into your office, in which you were able to detect an issue early on and therefore make a difference in that child's eye health? 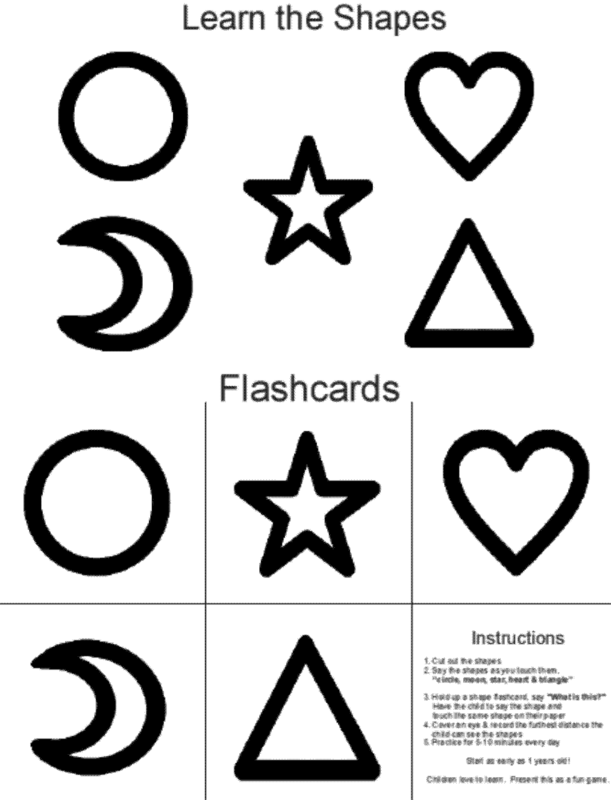 One time a boy came in for a bump on his lid and his mother was shocked to find out he couldn't see the eye chart. Then after their child started wearing glasses, his grades went from Cs and Ds in school to straight As. On another occasion, we had a 3-year old that wasn't learning how to talk. When she got her glasses, she started speaking. And the stories go on and on! If good vision is so important to learning, then why would you wait? Your child could be missing their chance to learn more every day. 9) Any further comments specific to pediatric care that parents should be aware of. Even if you don't think that your child has a vision problem, it is doesn't hurt to get a complete eye exam. Health insurance may cover the cost of the exam. 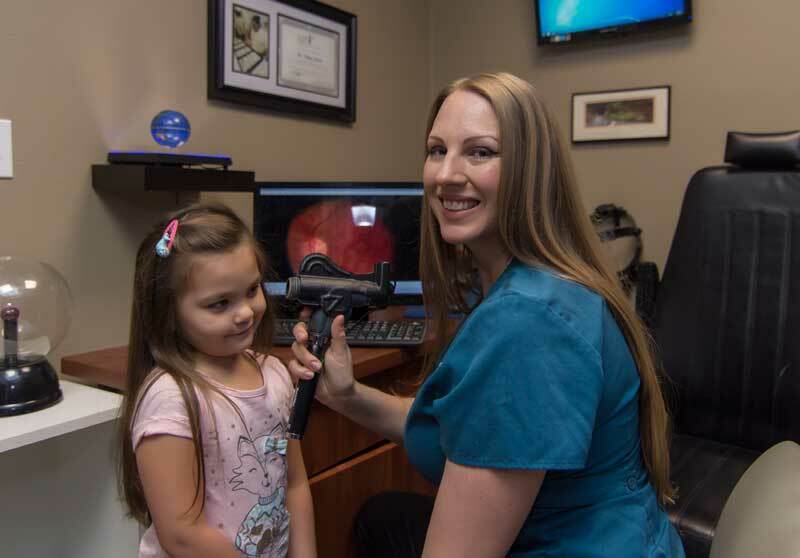 If your child had an exam with an eye doctor and you are concerned that the results weren't accurate, don't hesitate to get a second opinion with an eye doctor that specializes in pediatrics. To keep your child's vision on the right track schedule an appointment with one of Miami's best pediatric optometrists.